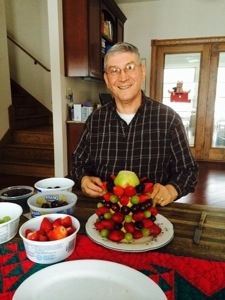 Thought I would share pictures of Bob making fruit tree. He peeled a pineapple and used a pear on top to give it the shape of a tree. He used strawberries, cherries, blackberries, green grapes using round toothpicks and a slice of star fruit for the top. Turned out so well! !